ViperVault is a fast, affordable, 100% secure, fully resilient, cloud based backup, disaster recovery, replication and full continuity service. It is the ONLY solution to provide replication and continuity services for both ShadowProtect AND AppAssure images, as well as regular "file and folder" backups using our own free (but fully featured!) backup client. The unique Continuity Cloud allows ultra-fast recovery & provisioning of a server environment in the cloud following a disaster or on an as-needed basis. ViperVault's own free backup client also allows customers to backup & replicate servers, workstations, files, folders, Linux, Mac OSX and applications such as Exchange, SQL, MySQL and Oracle quickly and easily. 10 minute setup. Automated protection. Web-based monitoring. Unified online and local backups. Competitive pricing. Pay for what you use. Backup whatever you like - from entire servers to individual files and folders. YOU have complete control over backups, restores, downloads and replication settings. 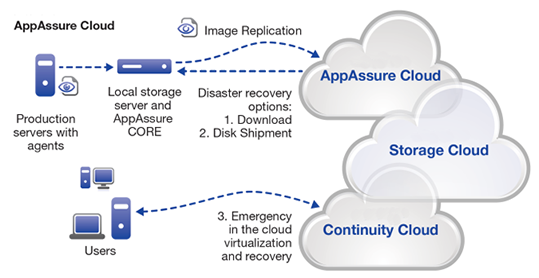 ViperVault AppAssure Cloud is a service that securely replicates Dell AppAssure bare metal backup images to the ViperVault Storage Cloud and enables multiple disaster recovery options. ViperVault delivers all the required components, including block storage capacity and multiple recovery options - including image download, overnight drive shipment, or direct bare-metal recovery in the ViperVault Continuity Cloud. AppAssure software enables the fast, reliable backup and recovery of server and workstation images to physical or virtual environments or to dissimilar hardware. AppAssure's software features granular retention features, global deduplication capabilities, encryption, integrity checks, and virtual standby technology. ViperVault enhances the power of the on-site AppAssure solution with a public cloud replication service that leverages ViperVault's reliable, petabyte-scale storage cloud, proactive data integrity protection technologies, and emergency in-the-cloud virtualisation service capabilities. ViperVault ShadowProtect Cloud is a service that replicates StorageCraft ShadowProtect bare metal backup images to the ViperVault Storage Cloud and enables multiple disaster recovery options. ViperVault delivers all the critical storage and and service components required, including block storage capacity and multiple recovery options - including image download, overnight drive shipment, or direct recovery in the ViperVault Continuity Cloud. 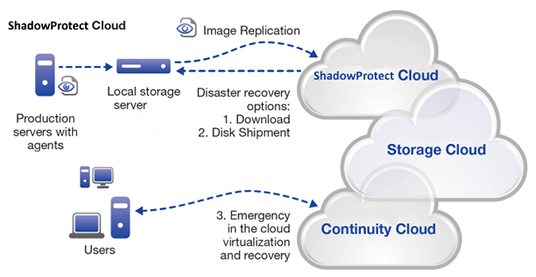 ShadowProtect software enables the fast, reliable backup and recovery of server and workstation images to physical or virtual environments or to dissimilar hardware. ViperVault enhances the power of the local ShadowProtect solution with a public cloud replication service that leverages ViperVault's reliable, petabyte-scale storage cloud, proactive data integrity protection technologies, and emergency in-the-cloud virtualisation service capabilities. Do you want to move away from your legacy tape backup solution, but don't want the expense or management overhead of a full imaging solution like AppAssure? ViperVault Backup Solution maybe the answer you've been looking for in a truly simple "Set it and Forget It" solution. ViperVault backs up all your Windows, Mac OSX & Linux systems, servers, desktops, laptops, files, folders, Exchange, SQL, Oracle, MySQL and more. You can store a backup copy locally for fast access, and you can choose what is replicated securely to our online service.